On her way to St. Mary Mead, Mrs.McGillicuddy is shocked to her core when she sees a murder committed, by a man whose face she can't see, in a passing train. Luckily for her, she is going to visit an old friend who happens to be great at solving murders! 4.50 from Paddington, or the title I like better, What Mrs. McGillicuddy Saw!, is one of Christie's more improbable stories. As far as the identity of the murderer is concerned, we are given no point of reference from which we can look back and say, of course, that did seem suspicious, that did indicate so and so! No clues link back to the murderer and we are given no points about his character before the final revelation! (Somewhat like in The Sittaford Mystery) It was an impossible, unlikely and incomplete story. "I have only pity for those poor souls who cannot enjoy the sprightly stories of Agatha Christie; but though sprightliness is not the least of this remarkable writer's qualities, there is another that we look for in her, and that is detection: genuine, steady, logical detection, taking us step by step nearer to the heart of the mystery. Unfortunately it is that quality that is missing in 4.50 from Paddington. The police never seem to find out a single thing, and even Miss Marples lies low and say nuffin' to the point until the final dramatic exposure. There is the usual small gallery of interesting and perfectly credible characters and nothing could be easier to read. But please, Mrs Christie, a little more of that incomparable detection next time." That being said, it was still a mystery novel with a satisfying murder and a nice little love triangle developing in the midst of all the worry! There is after all, something to be said for Christie's romances - although in this case, the incomplete ending extended to the romance!! 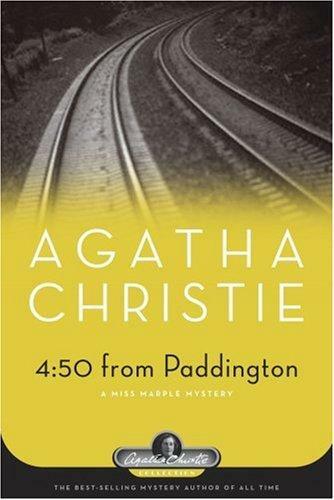 The only thing that made the story likable was the character of Lucy Eyelesbarrow (I have never enjoyed Miss Marple's stories), and as we were nearing towards the resolution of her story, Christie mischievously cuts it short and leaves us in suspense!! The novel contains characters from Miss Marple's world including her nephew Raymond's son and the son of her vicar Leonard Clement. Chief Inspector Craddock, who appears alongside Miss Marple on numerous cases, is the godson of her long-time friend Sir Henry Clithering! I just add these facts as interesting tidbits on Christie's world.